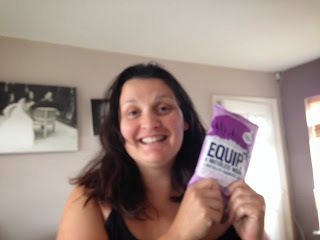 EQUIP is a 'waterless wash'. We recognize that not all of us can shower easily, and sometimes we’re not in a place where traditional bathing options are even available. We’re going to let you in on a little secret: you don’t need water to clean your hair. Seriously. Which is just great news for anyone who has spent hours in the queue for a broken shower at a festival, or someone having difficulty showering but wanting clean and fresh hair. 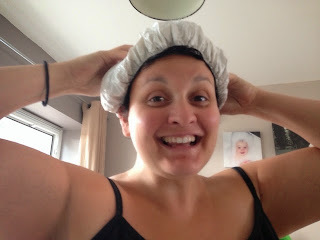 Our waterless wash shampoo cap is really easy to use. Cover all your locks with the cap, and massage your head for a couple of minutes to release the shampoo and conditioner. This action cleanses the hair and scalp. No rinsing required. Just towel dry your hair and style to finish. Simple and effective for all ages. The cap can also be microwaved so it is nice and warm - simply pop the unopened pack into the microwave (750W) for 10 - 15 seconds (check temperature before using - microwave times vary). 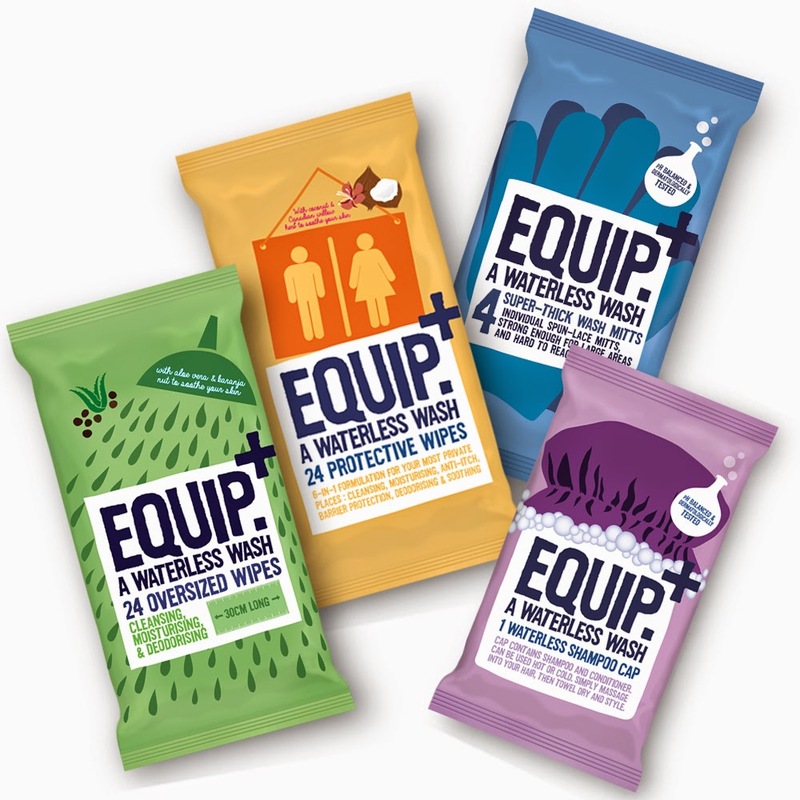 Because staying healthy challenges come in all shapes and sizes, we’ve devised a range of pre-moistened waterless protective hygiene wipes, designed for your mostintimate places. Specially formulated with Canadian Willow Herb, an anti-itch ingredient, EQUIP waterless wash wipes work to protect skin integrity and maintain well-being. 6-in-1 action to cleanse, moisturise and protect. Large size for effective coverage. Clinically tested and safe for skin. Why are they oversized? So they can help get more of you cleaner, quicker! The large surface area makes it easier to get around your body for a soothing, just showered feeling. With a blend of coconut extract, aloe vera and Karanja nut… hmmm, quite luxurious, wouldn’t you say? And because they’re grown-up wipes, it means you use fewer sheets. Dermatologically tested and pH balanced, so they’re mild and kind to skin. EQUIPpre-moistened Wash Mitts are super-thick, strong and excellent for those hard to reachplaces.Specifically formulated to cleanse and moisturize and leave you with that fresh, just showered feeling.Ideal when caring for oneself and others.Dermatologically tested and pH balanced so they’re mild and kind to skin. You just pop on the cap and massage until your hair is saturated and for about 3 minutes, the pop it off towel dry and you are done. It was quite refreshing and getting into the festival spirit of sharing, I also got Spartacus to give it a shot, and their was enough moisture to wash his hair as well! It was really easy to use, I have mixed feelings on this one, my head felt refreshed afterward and there's a nice scent but my hair wasn't 'go out with it down' clean. 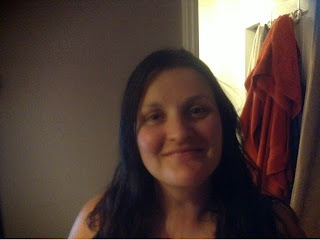 I wonder if maybe I didn't towel enough moisture off because my hair felt like it had a residue on it still. Spartacus however had better results so maybe longer hair just needs a bit longer in the cap. We've tried out the shower glove which is really good, fresh and easy to use and would be handy to keep in a bag if you have a long day or day to night transition to get through. Now I'm not a camping fan, I've slept outdoors in a tent once. That was on a beach in Goa, the 'tent' had a carpet and two wooden beds and a proper loo and shower! Yet still I didn't sleep for fear of tropical spiders biting me! But if you do go camping these are great, and to be honest they'd be a festival goers best friend. The gloves are easy to use and left me fresher than before use and the large wipes are great, lots of cleaning power and they really are biiiiig! These products have loads of potential applications, I personally think they'd be great for long haul flights, I remember traveling to South Africa and NEEDING to freshen up and change clothes at the stop over, these would have been great to have. If you find yourself in need of bed rest or unable to get in the bath then these are a great short term solution. With an RRP of between £2.29 and £3.69 they offer value for money for camping, festivals and travelling.